Today would be my husband's birthday and I promised him I'd make sushi for lunch. I did make sushi, actually a ton of sushi on a huge platter, so we've got this and about 4-5 times more because I decided to use all the rice, defrosted some sushi grade tuna, bought crab, and opted to try a bit of grilled salmon. 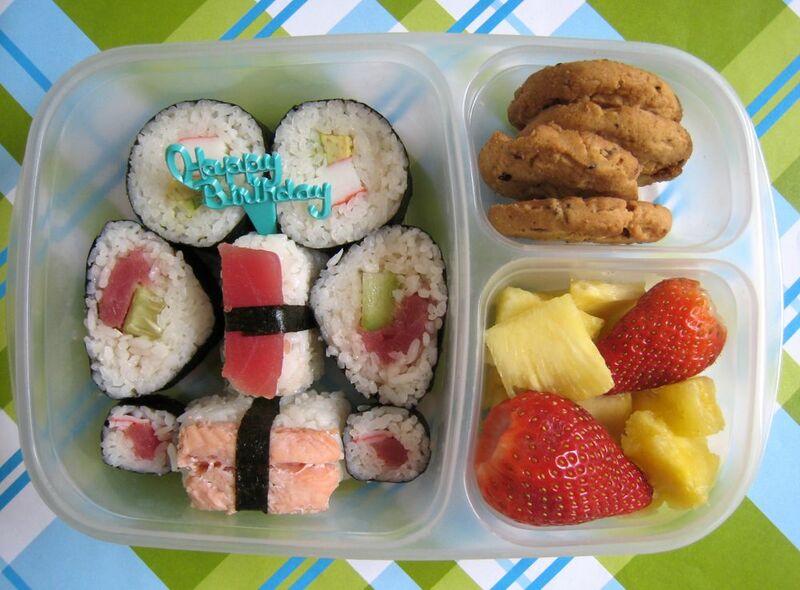 The right compartments hold his favorite Thank You Berry Much Girl Scout cookies and some pineapple and strawberries. The salmon did not turn out as well as I hoped. It tasted fine, but I had to cook it (frozen and I'm not a fan of food poisoning), so it started to flake. Got to work on that one to make it a bit prettier! Happy Belated Birthday to you hubby! he must be really happy to get such a nice meal (made with love)for his birthday! Looks awesome, Happy Birthday lunch indeed! Beautiful tight rolls there Shannon! What a wonderful birthday! !